Leadbit - Cool and high-perspective AN that will help you ger richer quicker! 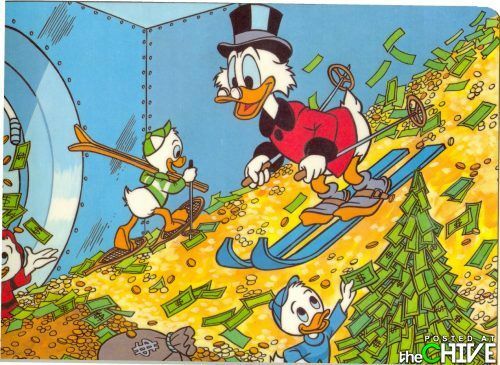 We are cool and high perspective AN working on standard CPA - “cost per action”. In our network we have thousands of registered international webmasters that allow you to work with any kind of traffic from all the countries. New Webmasters and Advertisers are always welcome in Leadbit! SpyOver and Freshlydeals like this. You guys are welcome to try Leadbit! All the information and all the details will be added soon! Keep in touch! So, we can't wait to see your name in a Leadbit users list! So excited! Our GEO: RO, ES, HU, RU, HR, BG, PL, GR, HR, CZ, SI, SK, RS, PR, TR, DE, etc... And we are keep on moving forward. Asia, LatAm, you are next! Publishers, check out our exclusive offers and get bigger! Advertisers, you can be sure that your products are selling out! SO, it's time to JOIN LEADBIT TODAY! 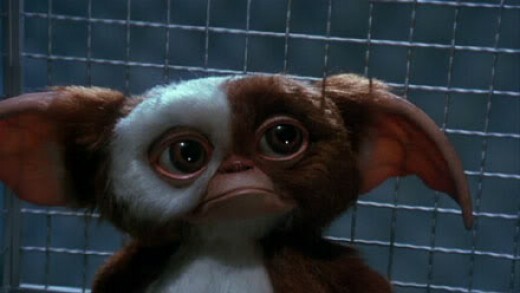 mamunmirdha and Nanette like this. 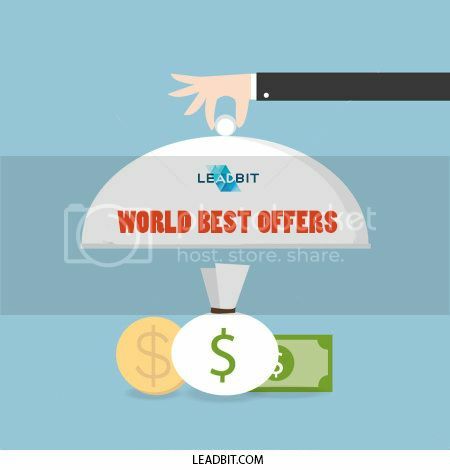 Visit LeadBit Network Reviews by Real Affiliates | oDigger and check our cool offers! New cool offers are available now: Silverex (power capsules for men). We have a new GEO available now! Our products and offers now can be promoted in two new countries - Cyprus and Greece! 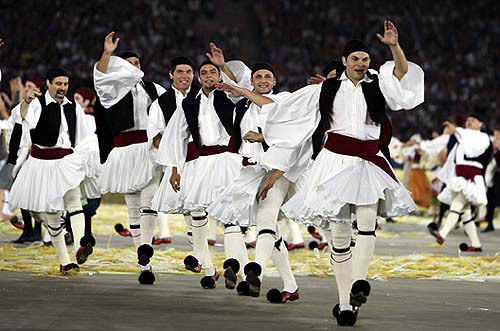 Go, register and promote our cool new offers in Greece! We are proud to announce that first great offer for Turkey are available now! Please welcome Machoman TR, Maxisize TR, Fitospray и TR Silverex TR. Payout for webmsater - 8$! We love to share with you one of our best offers! Do you want more cool offer? Hi everybody! Hope you are having a great week. Want some good offers and verticals? Yes, we have em! New offers - Posture Support and Zerosmoke are available now. All Promo materials are on Russian! 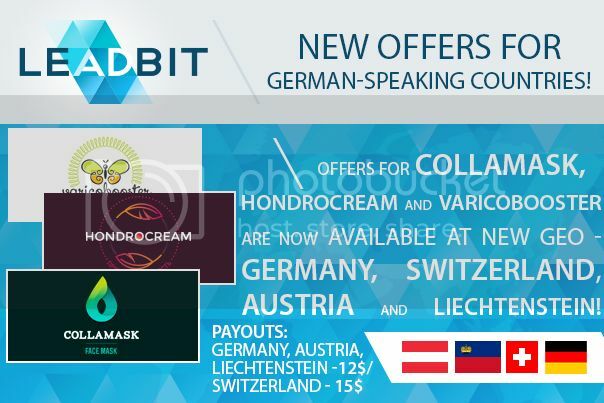 Offers for Сollamask, Hondrocream and Varicobooster are now available at new geo - Germany, Switzerland, AUSTRIA and Liechtenstein! Bom dia! 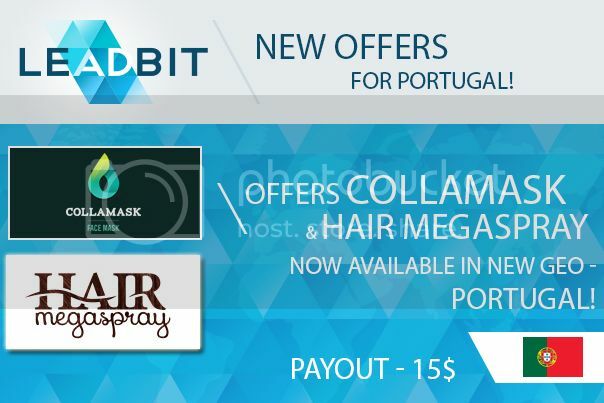 Two more highly reccomended offers with great payout is now available for Portugal! 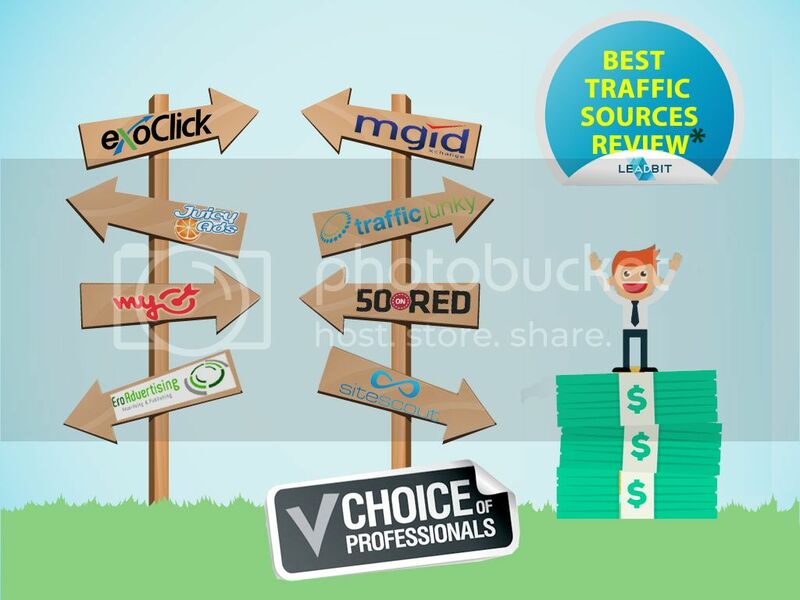 Have you already seen our review of the best traffic sources in 2016? No? Go and read it! We are totally sure that it would be usefull for you! Check them now! Offers are updated daily! 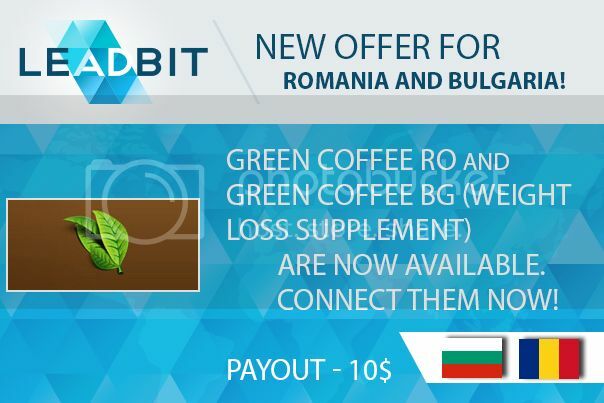 New offer is now available for Romania and Bulgaria! Today we are announcing the launch of two new offers for Romania and Bulgaria. Green Coffee RO and Green Coffee BG (weight loss supplement) are now available. Connect them now! New day brings some chages! Since today, the offer Silverex (available for France, Croatia, Italy, Hungary, Poland, Portugal, Greece, Czech Republic, Spain, Slovenia, Deutschland, Bulgaria, Romania and some other countries) is replaced by a new product - Erogan (all promotional materials stay still). Hurry up and connect it! Good stories come to good prelanders! One of the most effective prelanders - “Cinderella: Weight Loss success story (- 60kg)” is now available in new languages – Croatian, Cezch, French, German, Spanish, Greek and corresponding countries! Hurry up and try it now! 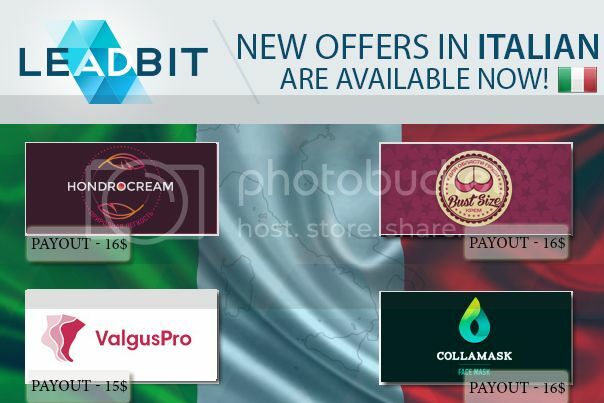 4 new offers are now available in French and corresponding countries (France and Switzerland) - Bust Size, Valgosocks, Valgus Pro and Varicobooster. 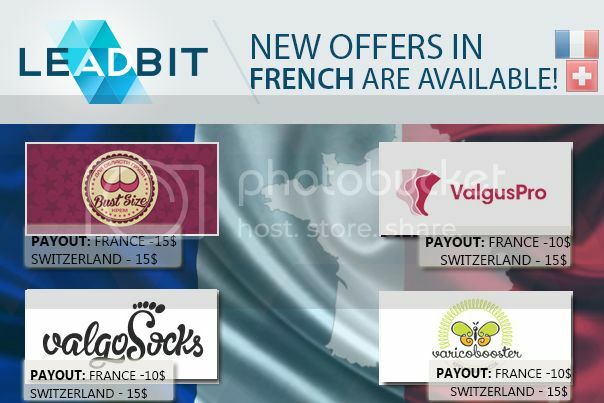 Payout: Bust Size (France and Switzerland - 15$), Valgosocks, Valgus Pro, Varicobooster (France -10$, Switzerland -15$). Do you speak German? Our new offers do! 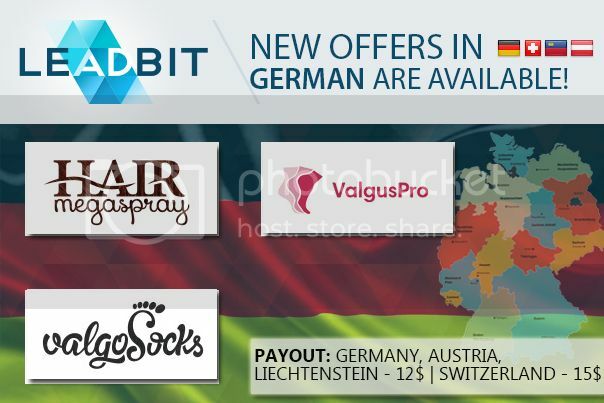 Valgosocks DE, Hair MegaSpray DE, Valgus Pro DE are available in new countries - Germany, Switzerland, Austria and Liechtenstein!